National Programme for Control of Blindness was launched in the year 1976 as a 100% Centrally Sponsored scheme with the goal to reduce the prevalence of blindness from 1.4% to 0.3%. As per Survey in 2001-02, prevalence of blindness is estimated to be 1.1%. Rapid Survey on Avoidable Blindness conducted under NPCB during 2006-07 showed reduction in the prevalence of blindness from 1.1% (2001-02) to 1% (2006-07). Various activities/initiatives undertaken during the Five Year Plans under NPCB are targeted towards achieving the goal of reducing the prevalence of blindness to 0.3% by the year 2020. 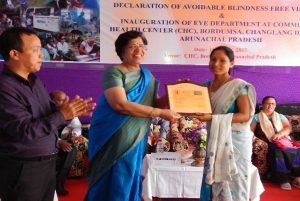 The programme has been renamed in 2017 as National Programme for Control of Blindness and Visual impairment to include the services of visually impaired group. Reduction of backlog of Cataract Blindness in the state as per the mission goal of Government of India, for free cataract operation are performed. Screening, identification, treatment and referral of diseases like Diabetic retinopathy, Childhood blindness including Retinopathy pf Prematurity, Glaucoma, Corneal blindness and other posterior segment diseases. Screening of school children for refractive error and any other childhood diseases of the eyes. Free spectacles to the school children detected with refractive errors. Awareness generation through IEC activities during National Fortnight on Eye Donation, World Sight Day, World Glaucoma Week and IEC and BCC activities for focussed group. Development of infrastructure like Dedicated Eye Wing in select General or District Hospitals, Vision Centres in CHC and PHCs. Eye Donation activities through Eye Donation Centres and Counsellors. Collaborating with International/Local NGOs for bringing efficiency in the Eye Care Services. Coordination and convergence with RBSK and Education Department for effective intersectoral service delivery. Free Spectacles to poor school Children and reading glasses to elderly population. Grant in aid to District Hospitals and Sub- District hospital for strengthening service delivery. General/District Hospital with Ophthalmic Assistant: Bomdila, Seppa, Palin, Daporijo, Pangin, Yingkiong, Namsai, Changlang, Khonsa and Longding. Community Health Centre with Ophthalmic Assistant: Dirang, Rupa, Bhalukpong, Seijosa, Chayang tajo, Itafort, Doimukh, Yazali, Basar, Khamba, Ruksin, Bordumsa and Miao. In districts, the District Medical Officer is the Nodal Person for implementation of the NPCB &VI activities in consultation with the Eye Surgeons and with the help of ophthalmic assistants of that district.